Troops will need to attend one of the Pre-Check In events in order to assure our Check In for Camporee runs Smoothly. Adults will also need to be checked in. Troops are requested to check in all patrols attending on the same night but if you have a need to check in patrols on different nights, please contact Kevin Ward. If your payment will not be ready by the check in dates please contact Charles Pickering or your patrols may lose points. Lunch Tickets can be purchased at Check In. Patrols can cook their own lunches but if you want to see your options click on the Menu. 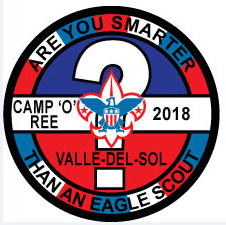 Scoutmaster Specific Training available at Camporee Registration is Online!